If you are thinking about buying your first or your next ukulele, you are probably hesitating a lot. That’s why we wrote this article to help you make a good decision according to your budget. Actually, the first decision you have to make is how much you want (or you can) spend. And then know on what you are spending it. Ukuleles are manufactured in four common sizes or formats : soprano, concert, tenor and baritone. Regarding tuning, the soprano, concert, and tenor ukuleles use the same in general: from fourth to first, G C E A; the baritone is tuned one fourth lower: D G B E, exactly like the first four strings of a guitar. Sizes are defined by their scale – that’s right, the string length – and by the size of the body, which accounts for the sound quality. your intention (or not) to carry you instrument no matter you may go. 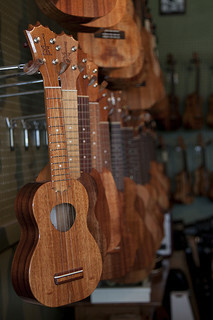 From left to right: soprano ukulele concert ukulele and tenor ukulele. The soprano, also called standard, is the original ukulele size, and it’s the smallest member of the family. Its scale – the length of the vibrating string – is between 345 and 355-mm long. The largest instrument turns out to be around 530 mm. The concert-size ukulele is a little bigger and has a deeper tone than the soprano. Its scale is around 380 mm and it is 620-mm long. (Note: when talking about ukuleles,“concert”refers to the size, not the quality, a concert uke is not better or worse than any uke of any other type). The tenor size follows suit to the concert model, it brings more volume and has a more complex sound. It is, in our opinion, the most appropriate instrument when using a fourth string in low-pitch. Its scale is approximately 430 mm, and its total length is approximately of 670 mm. The baritone ukulele, even bigger, has the same tuning as the first four strings of a guitar, and, of course, it gives a deeper tone. It has a scale of 510 mm and it is 740-mm long. So, from smaller to bigger size, we have: soprano, concert, tenor and baritone. There are also other peculiar combinations (longneck, super concert, sopranino…), but we will keep it simple and not elaborate about that. For further information, please read [this article]. If you have some experience on the guitar, don’t be afraid of the small size of the soprano. A good instrument is the best starting point. But what is a good instrument? Ukulele prices vary from 30 euros to many thousands of dollars. Although you don’t need to spend a big amount of money have a decent instrument, you also need to understand that the cheapest ukulele on the market is not the best instrument. This is a guide on what you need to consider when buying an instrument (whether in this shop or in another one). The instrument must have a good finish, without apparent traces of glue and with an homogenous varnishing. The frets must be smooth and should not show any dangerous asperities. The intonation must be correct. Of course, we should avoid instruments with curved soundboards or veered-off necks. Some say that ukuleles are hard to tune : only ukuleles of horrible quality are, not even hard to tune, but just impossible to tune. On small-scale instruments, a measuring error of a couple of millimeters here or there can lead to a useless instrument. At Ukecosas, we review each instrument to confirm it delivers a decent intonation. But, watch out, if you expect a perfect intonation, you are shooting for the impossible. Wood is a material that is sensitive to changes in temperature and humidity, therefore the instrument will suffer from physical alterations from time to time, which will give it a slightly higher or lower tone, and rarely will it be perfect. The action is the height of the strings on the fretboard. It is lower on fret 1 than on fret 12. Be very careful with excessively high nuts: they do major damage to a good intonation. A low action should be good for you, unless you’re a wild rhythmic player and you strum very hard. It will require less strength from your fingers, and less distance to go, so it will be easier for you to get used to the instrument. A high action provides a little more volume, but it usually makes playing more difficult. The woods used for the instrument can be solid or laminated. Ukuleles with solid soundboard have more volume and a wider pitch spectrum, and, in general, the sound qualitiy improves over time and use. However, laminated ukuleles have a better tolerance to changes in temperature and humidity. But, watch out, laminated does not equal to poor quality: instrument manufacturers use laminated woods that are especially designed for this purpose. We advise that you go for a solid-soundboard instrument, if you can afford it. Within the most affordable range, laminated mora (nato, advertised as oriental mahogany) or agathis is used. Though these woods are not famous for their sound quality, they deliver decent and affordable products. Even within a low-price range, laminated mahogany ukuleles can be found, just as nice as their solid-wood bigger brothers, but with less powerful sound. If you are willing to spend a little more, we have instruments with solid mahogany soundboards and laminated mahogany sides and bottom, which are a very good option for tight budgets. Instruments made out of solid mahogany are a little more pricey. They offer more volume and a richer tone in return. If we continue to go up in price, we find cedar or spur soundboards combined with mahogany, maple, or rosewood (solid or laminated) sides. And exotic-looking woods such as mango or acacia wood, etc. The usual wood used for top-range ukuleles is called koa. It is a type of acacia that grows in Hawaii. It has a gorgeous aspect, and a shining and delightful sound. But this material is expensive and this is reflected in the final price. You will find instruments with a plain design, some more decorative, some even more decorative, some withprecious things incrusted and lines of various patterns. Though decoration does not impact the sound, one should bear in mind that lines (the decoration on the side of the soundboard) serve as an extra protection against dangerous hits and children. Regarding varnishing, manufacturers usually apply lacquers especially formulated for use on musical instruments, in mate or gloss. This is a matter of design, so choose according to your own taste. You will find two types of tuners, mechanical or friction. Friction tuners (or tapered ears) have a more traditional design, mechanical tuners provide a turning capacity that make them more convenient to use. Both types work fine. Traditionally ,almost all instruments have used gut core strings. But these turn out to be expensive, fragile and unstable. The emergence of nylon induced a significant decrease in prices, and an improved stability, though some sound characteristics were lost. Aquila, an Italian manufacturer who has traditionally been producing gut core strings, started doing some research on new materials in the nineties. It developed nylgut, a material with a sound quality which was very similar to gut, but way more economical and stable. Over the past few years, nylgut strings have become the favorite strings for many ukulele players. On low-price instruments, Aquila’s nylgut strings make a difference. Fluorocarbon strings (manufactured by Worth, among others) are another interesting alternative. We do love our solid mahogany ukuleles. if you prefer nylon, you will also find Ko’olau strings in our catalogue. They are perfect for top-quality instruments. Most of our ukuleles come with good-quality strings (almost all of them have Aquila strings, others have Worth strings). For bottom-of-the-range instruments (that come with poor-quality strings) we offer you the opportunity to put on a good string set for just a few extra euros. It depends. Some are very cheap and worthless, some of decent quality start at 80-100 euros, and some are very very good and very very expensive. Obviously, there are differences between each range. The manufacturing process and attention to detail in the finish.The more detail the process requires, the higher the price. On lowest-price instruments quality control is rare and tuning problems are too frequent. The wood,essential to the sound. Those with a solid soundboard sound louder and better, and they improve over use. Laminated models are more economical, but they don’t have the same richness of sound, and barley improve over time. However, they are more resistant to sudden climate changes. A solid soundboard and laminated sides is always a good option for a good sound/price ratio. And, of course, each type of wood provides a different sound quality. Decoration. More decoration, more expensive. These are details on which you can save or spend as much as you want to. It’s not a bad thing to consider that the borders on the soundboard and the bottom provide extra protection against hits, even though they make no sound. The Set-up: The more time spent, the higher the price ends up. A proper “setup” adds a lot of value and playability to your ukulele. Setups usually include the following checks: string Action (nut/saddle), intonation (Frets), finishing (Tighten tuners, hydrate instrument…), etc. For models issued from the same series, a soprano turns out to be more affordable than a concert or a tenor. I have seen advertised some ukuleles with EQ’s and tuners built in, whereby you plug it into an amp. How does this work on Non metallic strings and, are they effective. Is it worth considering buying one.